The Original Steve LaPorte Indoor Putting Greens: The Original Steve LaPorte Indoor Putting Greens teams up with Hanae Mori/ICP Perfumes for the 2nd time in just 2 years. The Original Steve LaPorte Indoor Putting Greens teams up with Hanae Mori/ICP Perfumes for the 2nd time in just 2 years. 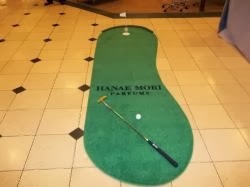 The Original Steve LaPorte Indoor Putting Greens has just teamed up with Hanae Mori/ICP Perfumes for the 2nd time in just 2 years to provide several custom indoor putting greens with product logos and accessories. These indoor putting greens with be used in multiple regions of the country for events and product promotions. "I look forward to working with Hanae Mori/ICP Perfumes again. Providing quality indoor putting greens to our customers has been our specialty for the past 15 years. I am proud to have ICP Perfumes as a client and look forward to working with them on this project and many more. We take pride in serving our clients and providing the best quality indoor putting greens on the market today."